Malalai Joya, an outspoken critic of the war in Afghanistan and the youngest woman elected to that country’s parliament speaks at the University of Calgary on Sunday October 10, 2010. CALGARY — The youngest woman ever elected to Afghanistan’s parliament told a Canadian audience Sunday that the NATO occupation of her homeland is supporting a puppet government and making Afghanistan a haven for terrorists and drug-trafficking. 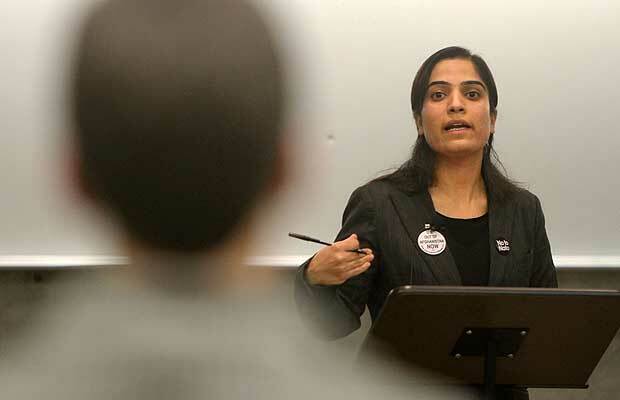 Malalai Joya, an outspoken critic of NATO and the U.S. involvement in Afghanistan, was invited to speak at the University of Calgary on Sunday by the Afghan Canadian Students’ Association. On her first visit to Calgary, the 32-year-old said Afghanistan called on Canadians to support the fight for a lasting democracy in Afghanistan.